Among the scorching sand dunes of Dubai, a spectacular and truly eye-catching artwork glances back at its viewers. Part of the typically unconventional Red Bull Curates exhibition program, Jigsaw enhances the city’s collection of (steel and concrete) giants with an intriguing, modular behemot. Created by Guido van Helten, Jigsaw features the Australian artist’s signature style and subject: a monochromatic, photo-realistic portrait. In this case, a pair of expressive eyes painted on 63 containers. 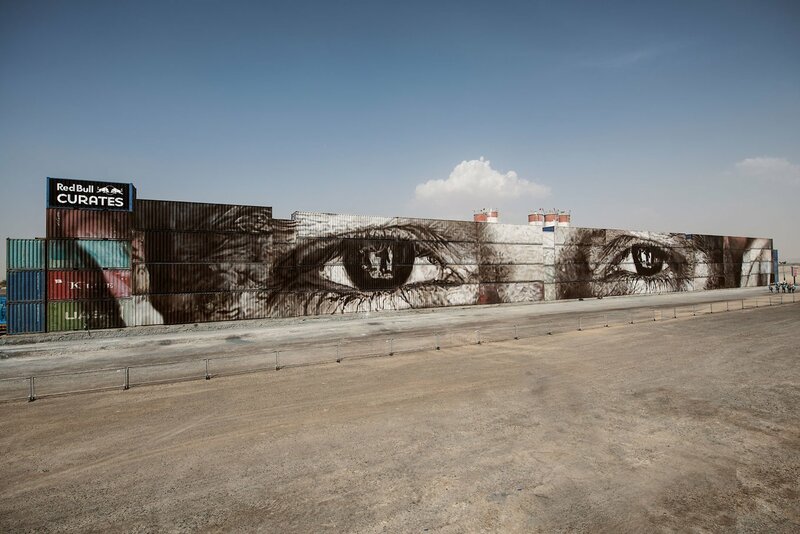 With site-specific murals all over the world, the artist traveled to Dubai for this particular piece. To the city which hides a rich character behind a glossy layer of wealth. “I’ve had preconceptions about the place that have been thrown out the window. Of course, there is a world of money and business but behind that there are everyday people who are working everyday jobs. I did not realize how much of a diverse place it is. I didn’t realize how many different cultures there are in the city,” the artist says. For van Helten, creating artwork that has a deep cultural connection to the local site is always crucial. While roaming the site with his camera, he stumbled upon his subject – a camel hoarder. “I’m interested in exploring these people and allowing the subject matter to present itself to me,” the artist explains. “In this case that near the wall there were people who run a camel farm. So I approached them and offered myself as somebody who is interested in what they are doing there,” he adds. Similarly to his previous work, the piece displays the artist’s ability to create haunting art with a melancholy atmosphere. Apart from bringing street art to the desert, the artwork also breaks some records. As the largest reconfigurable street art piece in the world, Jigsaw includes 63 containers, measures 135 meters in length and 12 meters in height, tipping the scales at 207 tonnes. Bringing the project to life unsurprisingly required some serious work and special tools. 18 days, 288 man-hours and 500 liters of paint, as well as 100-tonne cranes to position the containers. If you plan to visit Dubai, you can get a glimpse at Jigsaw by dropping by the 117LIVE’s Autism Rocks Arena on Al Ain road. Images courtesy of Red Bull.